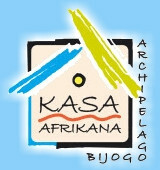 The waddling is an active type of fishing and very effective in the archipelago. Between the islands, there are a multitude of depressions, mountains and valleys but also winding lanes between ripraps in channels. Ideally you should practice waddling in 20 to 40 m deep waters, where the big fishes are in ambush. This mainly includes the African red snapper and black carp, the Cobias, the jacks and barracudas and sometimes a big shark on the prowl. The waddling as I practice it in these latitudes is a pleasant and little-tiring fishing. 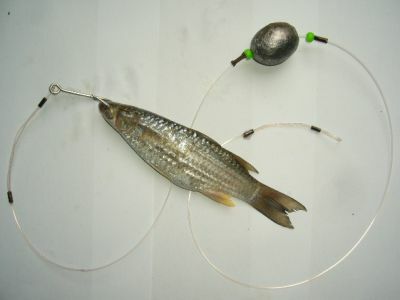 Thanks to an assemblage like that of the picture, I sting a small dead but fresh mullet through its eyes and I let the whole thing go down in the water drifting a little before the slack tide or during small tidal coefficient . Once I have touched the seabed I pull it back up a little (about 20 or 30cm) from the bottom and then I let it drift in the same way as the relief. From time to time, I loosen the thread in order to feel the contact with the seabed and I start again. The dead fish would follow the seabed's curve and pass by the predators' faces in ambush. The bites are very violent and powerful, you should firmly hold your rod's bottom and not forget to skitter vigourously except if you are using a circle hook. It frequently happens that the assemblage waves behind the boat so in order to avoid the problem, I use 400g olive sinkers that I cast in an egg-shaped mould. For those who are interested in that technique I will be able to provide these sinkers on the spot. 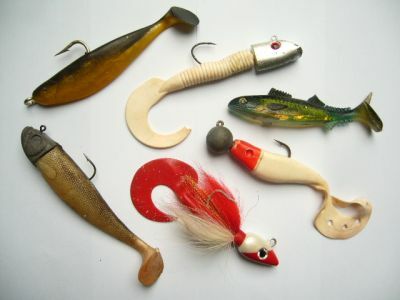 It is no less efficient to fish with flexible artificial lures with leaded heads (see photo) but as far as I am concerned, I deplore the fact that it is so difficult to get 150g leaded lures especially because they are very useful for vertical fishing when we have to fight against the wind and water drifting.